It’s been raining again for several days. This morning, the rain seems to have finally brought the thunder and lightening along for company. I love going to sleep and waking up to the sounds of passing storms. The wet is often inconvenient in our lifestyle, but in spite of that, I still find the sounds of nature to be soothing to my soul, especially the wet sounds. Guess I owe that, at least in part, to being a Pisces. Last night, we had a brief reprieve from the rain and an owl hooted softly nearby. Last week, I heard raccoons chittering as they foraged in the woods. The week before, our common yard was taken over by an assortment of birds. Last summer, before we left, I had a few evenings outside enjoying watching the bats dance in the one outside light on the property and last winter, I met three enormous deer in CB’s back yard one night. For someone with a love of nature and a need for seclusion but still with ties to the rest of the world, this property holds great appeal. It’s just enough off the beaten path that if you don’t know we’re back here, you probably couldn’t find us but I can be at Wal-Mart and what passes for a shopping district in about 3 minutes and I could be pulling up in the parking lot of my daughter’s apartments in about 5 minutes. Because the little town we live in hasn’t given completely over to becoming a shopping paradise like our neighboring city has, life seems to move at a different pace here. Almost everything seems to move at a different pace and you get that feeling of being secluded. My family moved to the outskirts of this county when I was 15. I went to the old high school, which isn’t a high school anymore. I see familiar faces in the grocery stores, restaurants and at red lights. I spent most of my adult life trying to escape this place. It seemed too “Mayberry” for me for a long time. I hated that it seemed so back-woods, that everyone seemed so redneck, that things seemed to work differently here than in the rest of the world. I felt, for a long time, that this place chewed people up and spit them out. Then, I really tried to leave. Last summer, I put this little town in my rear-view and drove away, heading to where I thought I could call home. About two weeks in, I started to realize that I missed “home”and with that, I began to feel for the first time that this was home. A truly strange feeling for someone that had never felt like home was really anywhere. Although we couldn’t really afford it, Paul and I needed these last few weeks alone together. There were things that needed doing, yes, but it was really more about the things we needed to be reminded of and damage we needed to repair. In these last few weeks, I’ve come to see the little town we live in more as home than ever in my life. I’ve found a sense of belonging that was missing before. Now I can’t imagine living anywhere else, another feeling I’m not used to. We needed time to switch gears and finish getting that hustle and bustle out of our systems. We needed time to get in step with where we are. We also needed time to get back in step with each other. Our relationship took some damage in those six months away. Paul didn’t want to move away before, but he agreed because he wanted me to be happy. We lived three months with a couple who claim to be happy and love and each other, but they seem to fight or ignore each other more than anything. We were told our relationship needed work, that we were too needy of each other, too clingy, and that it wasn’t normal or healthy for either of us. To us, it was their relationship that seemed unhealthy. We got married because we wanted to share a life, not just a house and paycheck. As it turns out, I think that had a lot to do with jealousy, but we were in their house, and it was family, so we tried to keep the peace. Then, of course, there was the fact that Paul was putting in, on average, 50 hour weeks. Most of the time, it was closer to 60. By the time he got home, got a shower and had dinner, he was falling asleep in his chair. The last few weeks, we’ve not only repaired a lot of that damage, we’ve gotten closer than before. Today (Sunday), Paul heads back out into the work force and we’ve had enough time together that I think we’re both ready for it. We’ve done what we can here, without a steady income, to get the place livable again. We’ve proven to ourselves that we can survive here, even through the absence of work if necessary. We’ve repaired and improved our relationship and found our bond again. We’ve forgiven each other for the mistakes of the past, including those six months, and now we’re finally ready to move forward again. Personally, I think 2015 is going to be our best year yet. I feel more at peace with my life than I ever thought possible. I’ve finally made peace with my demons. I accept now that the reason it seemed like I couldn’t escape this place was because I was meant to be here. What little family I have left is here and so are my only friends. I’ve made peace with the camper as well and I’ve even started to love it a little. I realize now that no matter what anyone else thinks about it, this is the life I’ve been given and I intend to make the best of it. I suppose my sister and our toxic and dysfunctional relationship was the last demon I needed to put to rest. It nearly cost me everything that mattered to do it, but now I finally feel free from the past. Of course, like everything else, I’ll always have memories and I’ll think of them from time to time, but I no longer feel chained to those memories. I no longer feel regret for things I thought could, or should, have been. Honestly, I don’t even miss them, which tells me it was never meant to be, but like most things, I had to go learn that the hard way. I suppose that’s just my nature. I’ve become tired of trying to resurrect the past. It’s kept me from enjoying the present and it’s blocked me from seeing the potential of the future with clear eyes. I’ve been told for three years that I needed to get over my mother, the things she did and said. That I needed to let that go and move on. Even my sister said that to me. I realize now that it wasn’t really my mother, or her memory, that I was holding on to. I was holding on to that need of family that her memory offered me. It was an anchor to the world in my mind. Roots, family, home, a history to go with it. I realize now that the reason I tried again, and tried so hard, with my sister was because she was my last remaining tie to my mother and the family that went with it. She was so much like mom that it filled a void and in her own way, I thought a relationship with her would give me the family I sought. Because she was so much like my mother, in laying our relationship to rest, I was finally able to lay my mother to rest in my heart. I realize now, as I should have years ago, that none of my ties to my mom will ever give me what I’ve been searching for. She never provided me with a family that she didn’t take away from me. The past is lost to us all. None of us can really change what’s gone. There are things in the past that are better left alone. The needs of one, or even two, can’t overcome that. The truth is, I don’t think my relationship with T was ever really meant to be. We were trying to live in a present that the past never provided us. My mother married her uncle, which technically made us cousins by marriage. We were told the intention was to get custody of us both and raise us as sisters, so the terminology stuck. We were three and four years old then. They divorced after a short marriage and we didn’t even see each other again until I was 17 and she was 18. Since then, she’s been out of my life more than in and every time has ended in disaster. I know now that it was because we were trying to live a relationship we had no history for. We were never sisters, only barely -and briefly- cousins. The fact that we were so disposable to each other proves that. She told me in her goodbye letter that “out of respect for her husband, she couldn’t be in my life anymore”. There was some vague reference to some wrong my husband is being held accountable for, although she never said what it was. Either way, it doesn’t matter because I’ve come to realize in the last few weeks that even if she’d wanted to continue to have a relationship, I couldn’t have one with her out of respect for myself. I’ve done my grieving for things that were never meant to be. I’m done trying to be someone I’m not for the benefit, or acceptance, of others. I realize that I’m an odd duck and not everyone’s cup of tea, and that’s fine, since I’d rather be someone’s shot of tequila anyway. 2014 has been an experience, to say the least. Most people around 40 (I turn 40 this year) go through a mid-life crisis of some sort. They’re either out having affairs with much younger people and buying inconvenient sports cars trying to recapture their youth, or are on an inner journey trying to “find themselves”. For me, 2014 was definitely an inner journey, but it wasn’t to find myself really. It was more of a journey to find who I wasn’t. What I didn’t realize six months ago was that I already knew who I was. It took me running off and trying to be someone else for a while to realize that. While I was on that journey, I realized that I’m just not a very money oriented person. If I have money in my pocket, you can bet I can find a real need to spend it on. Because of that, I’m nearly always broke and waiting for payday to roll around again. Life has been like that for as long as I can remember and I’m just not good at living any other way. I realized that having a nice house and a lot of fancy stuff just doesn’t rank high on my list of priorities. I’m as sentimental as the next guy (no, really, I am), but I’d rather have memories of who the person was than a bunch of extra crap to deal with every time I move. As far as my house goes, I’m perfectly fine with our tiny home. Being able to puff up and tell people how important my husband is at his work is another thing that doesn’t rank high with me. If his passions led him to be an important and high paid person at work I’d love him no more or be no more proud of him than telling people he’s a cook or butcher or anything else he could do. I want him to enjoy his job no matter what it is and I’m not going to crack a whip on his back because I want more than what we have. If I felt like that, I think I’d need to find another husband rather than demanding more and more from this one. Living a hustle and bustle life as part of the rat race or trying to fit in with a certain rank of society also isn’t my cup of tea. I’m a tattooed, Pagan grandma that would rather be on a motorcycle than drive a fancy car. I haven’t “fit in” with society in a long time and I’m ok with that. I would rather spend my days cooking, gardening and running around in floor-length skirts barefoot or on two wheels with the wind in my hair in the mountains somewhere than attending company dinners and wearing shoes that hurt my feet. I’d never be comfortable in that setting. I realize, as I’ve said before, that our lifestyle isn’t for everyone. What the “other half” need to realize is that neither is theirs. Not everyone is willing to sell their soul to the corporate gods to drive this year’s model car or have a maid. Some of us have other goals in mind, like staying sane, having time to watch our grandbabies grow up, planting a garden and enjoying life. It’s not that either lifestyle is bad or wrong, really, it’s just that life is different for some people. Some would say that living like we do should never be an option, much less a choice. I say as long as we’re happy, what difference does it make? Happiness comes in all shapes, sizes and walks of life. What makes me happy might make someone else miserable, but in turn, what another considers really living, might (and probably would) feel like a prison sentence to me. You should never, in my opinion, assume someone else isn’t, or can’t be, happy in a lifestyle simply because you couldn’t. You should never try to force your lifestyle on someone else, no matter how good your intentions, because you assume that since you couldn’t be happy that way, that they aren’t either. You should also understand that some people fall into a certain way of life because they didn’t have a choice but chose to make the best of it and after living a certain way for so long, not everyone can adapt to living differently. It puts me in the mind of a show I used to watch as a kid. “The Beverly Hillbillies”. For those who have no idea what that is, it was a show about a family of dirt-floor poor “hillbillies” that struck oil and moved to Beverly Hills because they were suddenly rich. They had a mansion and “Granny”, one of the main characters, still cooked possum for dinner. They didn’t know how to be rich, had no appreciation for money or the things it could buy. They had no concept that they’d been “poor”, because it was the only life they’d ever known. I remember my great Aunt commenting occasionally that you can take the hillbilly out of the hills but you can’t take the hills out of the hillbilly. Basically she meant that you can take a person out of the life they’re accustomed to and shove them into a different lifestyle, but in the end, they will end up living exactly the same way they always have because it’s all they know. That’s how those six months away ended up feeling to us. I was happy that my “sister” had a good life that she enjoyed. All of the things she wanted from life, I wanted for her, but I never wanted that life for myself. I let her convince me for a moment that I did but in the end, I was looking into urban homesteading instead of making plans for all the things I could buy and have. She was freaking out over her power bill and I was taking about solar panels and hurricane lamps. She was looking at high-end shopping and I was buying second-hand. She was shopping the big box stores and I was talking about hunting and growing our own food. We are from two different worlds. I thought we had enough in common for our relationship to survive but after moving down there and being told at every turn that if we were going to live there or do that, then we might as well have stayed in the camper where we were, I came to realize that she was right. We should have just stayed in the camper because moving to a different place and Paul having to work 60 hours a week for 4 months at a “good job” didn’t change who we were or what we wanted from life. That life ended up feeling like shackles and chains to us. So many rules, so much of who we were didn’t seem to be “good enough” for that life or the people in it. When we stopped being invited to anything but the holiday get-togethers, I started to feel like the family’s little dirty secret. I was told that none of how things ended was because we were being judged, but that’s simply not true and there’s nothing any of them can say to change my mind now. We were being judged before we ever left and the fact that our life was seen as “not good enough” had everything to do with T wanted me to move there. When we were first offered to come there, I was told it was because she and I needed each other. The kids had their own life and I spent most of my days alone and I was lonely. Being there would solve that problem. We were offered a place to stay so that we could relocate without having to save up a lot here first. When Paul got a job there with the same company he’d worked for here and got offered management we were happy but higher paying jobs continued to be pushed at us. When our credit and finances left us with few options other than a hotel or a run-down trailer park, I would have gone to the trailer park where I could have afforded to live, but I was told it wasn’t good enough and that she would be mad at me if we lived there. All of my purchases were scrutinized beyond the food I bought. The brand of dog food I fed my dog was wrong, only the more expensive brand was good enough and I was told I was going to kill my dog because I didn’t want to buy it. Yes, she ate that food while we stayed there but she ate little and infrequently. She didn’t like it but you’ll eat what’s available eventually if you get hungry enough. My body wash wasn’t good enough because I bought the cheap stuff and couldn’t see spending $3 or $4 on something I could buy for $1 that got me just as clean but might not be “anti-aging”. I was told I needed to buy a more expensive brand of foundation, more expensive skin-care, the list goes on and on. It finally got to the point that I’d go with her to do her shopping, but I did most of my shopping alone so I didn’t feel bullied into buying things I couldn’t afford and didn’t want. The whole thing went from being happy to be able to see my sister more often to hoping she didn’t call or hoping I could avoid an argument if she did. Of course, all of this was done in the name of “what was best for me”, but everything about my life and who I was seemed to be called into question and attempted to be changed. The only thing it changed was how I felt about them and it led to me feel like I’d been misled about their intentions in wanting us to move there. I never once agreed to change my life, my lifestyle or anything else but I was treated like I had. Their originally stated intentions for wanting us there quickly turned into something we hadn’t agreed to or wanted. In the end, I was told I wasn’t “living up to my potential”. According to whom? Her? Her husband? Her family? I feel like choosing to live with a smaller impact on the world we’re destroying day by day is living up to my potential. The person she “thought I was 20 years ago” was a child that didn’t know what she wanted or what the world was really about. Back then, I knew nothing of religion other than what I’d been raised in. I knew nothing of politics. I knew nothing of environmental issues. I knew nothing of the plight of animals, the dangers of destroying our world for one more apartment complex, office building or shopping center. I knew the world through the limited vision of the people who had raised me. People who cared nothing for animals, nature, politics, environmental concerns…all things that have become very important to me. How could you really see me as the person I am and not see that living a corporate consumer lifestyle would go against at least 75% of my personal beliefs? It didn’t take me long to see that my daughter wasn’t the only person she couldn’t see in the present. To her, we were still 20 and my daughter still a baby. Personally, I haven’t been 20 in a long time. There was a time, 20 years ago, when I thought I wanted a different life, a life that might have looked more like hers, but I’ve grown since then both in the idea of I’ve grown-up and grown as a person. Do I think my one little life can change the world? Maybe, maybe not, but I can live my life in a way that sets an example to the rest of the world, and even if I don’t change the rest of the world, I can change my world and my impact on the world around me. This year, unlike the years in the past, hasn’t really been about New Years Resolutions. There have been a few things I’ve said quietly to myself, but nothing I’ve made a big deal about so far and the flavor of the ones I have made has been different. 1. Eat home more, out even less. The move has really messed up all that wonderful cooking I was doing and the stress of trying to put the camper back together has caused an increase in convenience foods. 2. Figure out a better system for waste management. Right now, I have more bags of trash than I’d like. We really need to get on the ball with recycling. Here, I think we have to take off our own, and take it to the same place as regular trash, so it’s just a matter of implementing a system for separating it without having to run out the door every five minutes. We also need to get a portable sewage tank for dumping the black tank easier than the method we’re currently using. 3. Plant that herb garden I’ve been “meaning to plant”. I’ve said for years now that I wanted an herb garden. This is the year I intend to do it. 4. Finally fix the plumbing. One thing that’s been an ongoing problem with the camper is 30 year old, rotted, PVC pipe. All the plumbing needs to be completely rerun and we need a new hot water heater. Preferably another gas heater, solar or a rocket heater. 5. Get a better outdoor cooking system set up. 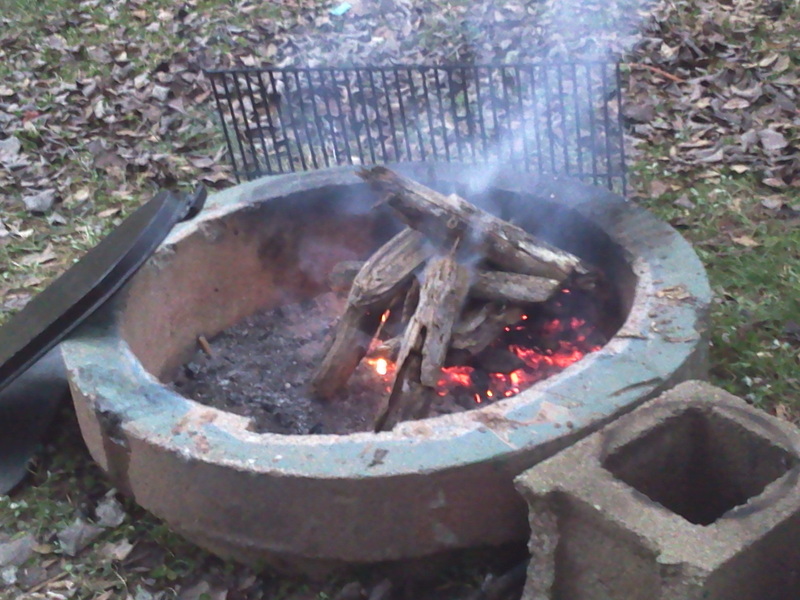 Right now, we have a little fire pit and some grates that we use. Paul wants to build a better fire pit with an outdoor oven. The camper is a one bedroom and that one bedroom was set up with two built-in single bunks. That room has been converted to a closet on one side and a pantry on the other. We started out sleeping on a drop down bed where the kitchen table is and I now have a queen-size air mattress taking up my entire living room. A futon for the living room would be awesome. That would mean during the day, I could actually have a living room. 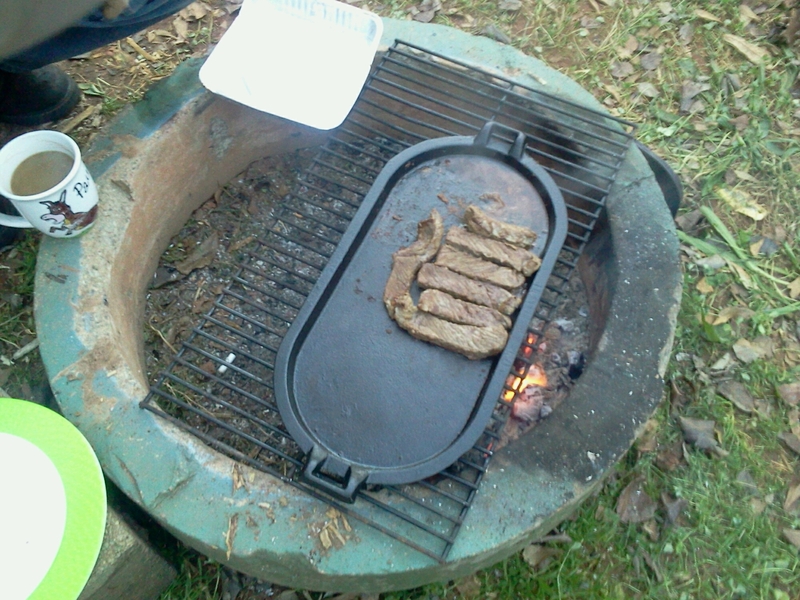 90% of our camper, like most campers, is set up to run on propane. When we moved in, there was two 40 lb tanks that were both too old to get anyone to fill them, so we used our one 20 lb and borrowed a second 20 lb tank from CB. I have to fill both of them once a week now, but if I was using my stove and oven and had hot water, it’d take a lot more. Right now, those two 20 lb tanks just cover heat and it’s a smaller heater than what we actually need. We’d like to get at least two 100 lb tanks. As you can see, there are no resolutions to start the latest fad diet, to exercise at least three times a week or anything like that. The last month has taught me that I’m really ok with who I am. I don’t feel the need for a bunch of self-improvement resolutions like I have in the past. In fact, if I had to make a personal resolution it would simply be to enjoy life more and to walk closer to my gods and maybe to cut myself a little more slack once in a while. I am, after all, only human and it’s human nature to be flawed.